Google wouldn't. Neither would Nike. The Greater New York Chamber of Commerce couldn't even name one business that would. Talk about their nap rooms. While Nike at least confirmed their existence in their Oregon offices, the list of companies refusing to talk to me on the record was growing as I set out to cover the topic. The experience was frustrating. You could even call it tiring. Of course, the search for sources is not a new challenge for any journalist. But it wasn't lost on me that I could take advantage of my own office's nap rooms to energize myself as I continued my quest. In the interest of full disclosure, Huffington Post Media Group Editor-in-Chief Arianna Huffington is an outspoken advocate for workplace napping, but took no part in this article. This past April, she invited embattled air-traffic controllers to come to our offices to take advantage of our nap rooms. At a talk that same month in which she discussed the subject, she noted, "It's better to have a nap than to have a doughnut." But when it comes to executives taking to the nap pulpit, Huffington is in the minority. "When I publicly discussed their nap rooms, Deloitte threatened to sue me," says Sara Mednick, an assistant professor of psychiatry at the University of California, San Diego. "We are not at our optimal performance across the day. The idea that people are not getting enough sleep is of course important. But this is true for even well-rested subjects. It's only a nap that allows workers to improve performance, or at least reach their baseline." Mednick, the author of "Take a Nap! Change Your Life," went on to argue that naps are far more important than any other light refresher that workplaces might offer. More than anything, naps improve a workplace's overall productivity, despite the image of a worker asleep on the job, she asserts. Indeed, the gold standard for those who recommend napping can be found in a 1995 NASA study that found "a 26-minute nap improved performance 34 percent and alertness 54 percent." According to Mednick, three metrics that show the merits of napping are as follows: pure errors on the job, visual alertness, and the ability to think creatively, as demonstrated through word association tests. To take the first measure as an example, when Mednick compared doctors working 30-hour shifts versus those working 10-hour shifts, the first group committed 700 percent more errors. The need for proper nap rooms is all the more pressing in round-the-clock work environments, says Eileen Murphy, the vice president of communications at The New York Times. "We designed relaxation rooms at the end of 2010," she says. "When you have people working till two in the morning, it became clear, in addition to getting some privacy and relaxation, it would be good for people to have a place to rest." As of January, The Times offers two 6-foot-long couches in the privacy rooms it included in its new building it opened in 2007. 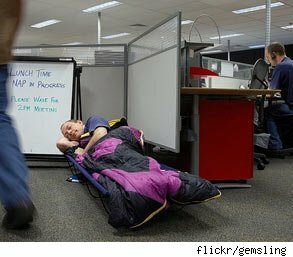 Indeed, the rising number of hours that American workers are putting in at the office only underscores the need for workplace naps. According to data compiled by the Center for American Progress, the typical American middle-income family worked an average of 11 more hours a week in 2006 than it did in 1979 -- and that was before the onset of unemployment caused by the economic crisis. As many analysts have noted since, those who have been able to hold onto their jobs have found themselves in an environment that sometimes demands they do the jobs of several people so that companies can cut down on costs. Whether it's that climate or other factors that have forced a rethinking of the relationship between and sleep and work, leading sleep scholars maintain that a shift has doubtless occurred. "The macho movement has ended," says William Anthony, the director for the Center of Psychiatric Rehabilitation at Boston University, and author of "The Art of Napping." "It used to be that if the CEO didn't sleep that was good, because then he was working all the time. People finally woke up to the fact you just can't function on no sleep." Humans' biphasic circadian rhythms means that it's not enough that we simply sleep well at night. We are pre-programmed to have a brief rest during the day during which we should enter the second REM stage of sleep. (Most offices that offer nap rooms encourage 20-minute sessions.) And while agrarian man was well-suited to midday naps, the Industrial Revolution did much to stamp out the practice. "The modern napping movement is really a product of the last 15 years," says Anthony, who along with Mednick has done as much as anyone to advocate for napping ever since David Dinges, of the University of Pennsylvania, established the science in the 1980s. "And it ebbs and flows with the economy. Companies don't want to give perks, like napping, in hard times, even though it is essential." He says the progressive thinking of a younger generation of CEOs during the dot.com boom helped bring back the practice made famous by such accomplished historical figures as Leonardo da Vinci, Napoleon Bonaparte and Thomas Edison. For the titans of the napping industry, the activity still doesn't have the standing in the office it deserves. 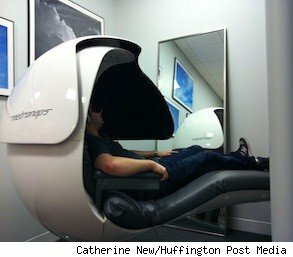 "If you don't go to the gym today, you can still be productive the next day," says Christopher Lindholst, co-founder of MetroNaps, which installs state-of-the art nap pods in offices like Huffington's. "If you eat a cheeseburger, you'll still be able to be productive the next day. Those are the two classic pillars for the workplace -- diet and exercise. But there's really a third workplace pillar -- sleep. And if you don't get enough sleep, you'll be tired, productivity will diminish. Investing in sleep will generate a much higher return than doing so for exercise or food." The futuristic-looking, covered MetroNaps units weigh 310 pounds, have music systems built into their contained consoles, and offer a cushion that elevates the feet of the napper. However, Lindholst's firm, which offers its pods in the U.S., Europe and Australia, has agreed not to disclose its client list, which he says numbers in the hundreds. Why the continued taboo? No company would ever hide the gym benefits or healthy eating options they offer. It's those very "pillars," to use Lindholst's term, that companies trot out to potential employees in the hopes of wooing them. But no one wants to underwrite the house George Costanza dozes off in, and the stigma of the lazy napping worker persists despite the data. "There's definitely concern over perception," says Stan Richards, the founder of the Richards Group, a Dallas-based advertising agency. "It's the, 'I don't want to be perceived as a slacker' thing." After making a midday visit to his house earlier this year, Richards found himself overcome with exhaustion. A self-described "fitness freak" who wakes up at 4:30 each morning to go for a run, Richards dozed off for about 15 minutes. Feeling refreshed, he decided to install four nap rooms in the offices of his agency. "It's not as high a number as I would have expected," he says. "But almost all those who said they had napped confirmed they enjoyed the experience." And another 150 employees expressed a desire to use the nap rooms in the future, he added.